Pack your bags for 'The Big Easy' and stay at this 2-bedroom, 2-bath vacation rental house in New Orleans! This charming home boasts 1,252 square feet, accommodations for 4 guests, and a open living space with chic decor. This is the perfect home base for all of your NOLA adventures as it sits just 2 miles from the famed French Quarter with endless boutiques, restaurants, bars, and more! Whether you're in town to party on Bourbon Street or feast on creole, this home is ideally located to it all! 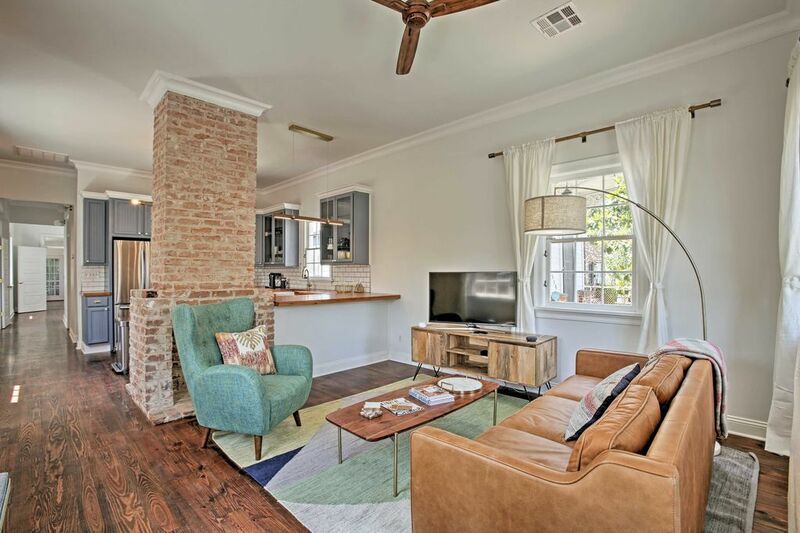 Situated in the up-and-coming Bywater neighborhood, this chic home combines modern conveniences with historic charm inside and is right in the heart of the action! Follow the hardwood floors into the living room featuring plush furnishings and a flat-screen TV with Apple TV. Walk past the decorative brick fireplace and into the fully equipped kitchen to try out a new recipe. You'll have everything you need to cook with ease including stainless steel appliances and ample counter space. Grab some fresh air on the back patio while the grill master cooks up some tasty barbecue on the gas grill. When eyes begin to tire, take your pick of the 2 spacious bedrooms to rest your head on the soft queen beds. Wake up and rinse off in one of the 2 bathrooms before heading out to explore this beautiful city. You'll love walking around the Bywater neighborhood and browsing the boutique shops like Euclid Records New Orleans or seeing the unique art and performances at The Music Box Village. Dig into some delicious barbecue at The Joint or sip wine and listen to live music at Bacchanal Fine Wine & Spirits, both within walking distance of the home. A short walk away is the unique Crescent Park, a 20-acre urban park with beautiful landscaping, bike paths, and scenic views of New Orleans. It wouldn't be a trip to NOLA without a visit to the historic French Quarter! With museums, shops, restaurants, and a vibrant nightlife scene, there's something for everyone in this entertaining neighborhood. Absolutely love this place!!! The owners were so accommodating!!! I recently stayed at the property and enjoyed the easy access to the French Quarter area. The home was very clean and comfortable and easily accommodated 4 adults. We stayed there with my sister and her husband who were celebrating their 50th wedding anniverary. We loved the house, beds were delightful, everything was clean and the house adorable! Easy to find and easy to get around to all the places we wanted to visit.We ate at Jack Dempsey's and had a wonderfu evening, a group was celebrating their high school reunion and had us join in the fun! The surrounding neighbors were nice and there was no problem parking our pickup. Couldn't have been better! This is a neat little house. The only hiccup we had was when we arrived the entry code didn’t work but the problem was quickly resolved. There is not a lot of stuff nearby but a quick Uber ride gets you to anywhere you desire. It was a god experience. The home is beyond adorable. The owners put in a lot of work to making this home Comfortable/Clean & Cool. I will definitely stay here during my next visit. They provide EVERYTHING you need. Better than any Hotel I’ve stayed in. Oh.... and they provided the BEST coffee. The house was great with everything we needed for a relaxing stay. We loved the location as the comfort of the home.